...last night and I'm very impressed. Last time I tried it was when it was first available on Android several years ago, and at the time it had some bugs, although it had the best voice guidance of any nav app like it. They've totally revamped the UI since then, and are using the same UI on the latest TomTom "Go" series hardware PNDs too. Among other improvements, it uses a single-line address entry like all the online map sites. that allows routes to be sent to mobileOS device running the TomTom app or to their newer PNDs. The TomTom GPS Navigation app is well worth a look if you have an Android device. It has a unique fully functional trial: free for trips totaling up to 50 miles per month. So that's a different kind of trial period: limited in distance, but it renews. My only complaint is, beyond that trial it uses a subscription model: $22 for 1 year or $50 for 3 years. That makes it more a lot more expensive over time than ALK CoPilot or Garmin StreetPilot. Here's a review that concludes: "Verdict This is the best GPS navigation app on Android." 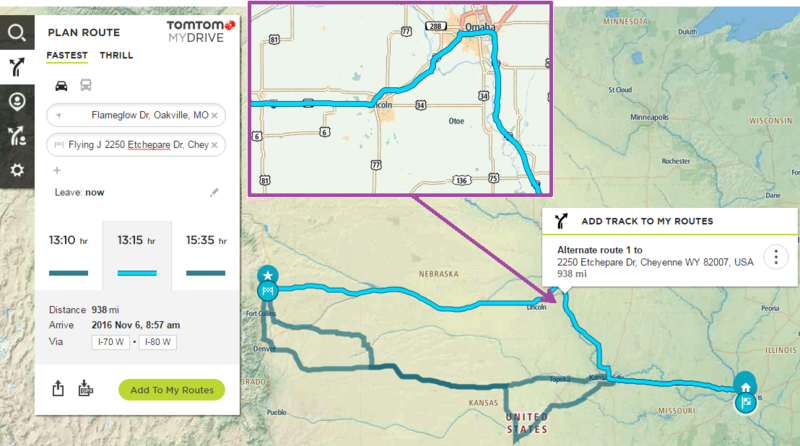 ROUTES created and saved on the TomTom trip planner website are sync'd between the trip planner and any mobile devices logged into the same account. But it's a one-way sync for routes. Routes created on a mobile device are not accessible from the trip planner website. But that's not a big drawback either IMO. Saved PLACES are sync'd both ways between TomTom trip planner website and mobile devices logged in. It happens very quickly too. Among other improvements, it uses a single-line address entry like all the online map sites. No more first the state, next the city, then the street name. The Nuvi has had this for awhile, at the top of the search page. But it's just as slow as the old method and doesn't seem to work very well. However the iOS StreetPilot app has something called "Local Search" as a separate icon on the Where To screen. I *think* this uses Google, because the old (discontinued) Nuvi connected models (1690, 1695) had something similar called "Google Local Search". Anyway, you can type whatever you like into this and it seems faster/better than the traditional (painful) Garmin search method. Also works great to paste coordinates into this. I should check out the TomTom iOS version if it's changed. Got very frustrated with Garmin the other day, they had an update that completely broke the app so it wouldn't open. The fix they suggested was to delete and re-download. Did that and it worked, but forced me to download the maps again (which takes hours) and it also erased all my waypoints. I tested the TomTom Android app (probably in 2013) soon after they (finally) made it available after it was delayed from when it was supposedly going to be available. It still had a few bugs even then, and like most of the other PND-makers' apps, it was basically a port of a TomTom PND UI. The new TomTom app is totally different than it was back then, but the new "Go" PNDs also have the same all-new UI, too. I have a few nits to pick with the UI, but all-in-all the new TomTom UI is way better than the others (like CoPilot) that will do what it does (like provide good, clear, accurate audible directions and visual junction views when needed). There is an app for Android, called TomTom GO Mobile. It replaced the old app, which had similar features to the iOS app. In March 2015, TomTom announced the new TomTom GO Mobile app for Android with a freemium subscription model for maps with the first 50 miles/75 kilometres per month being free, including all the maps that are available, TomTom Traffic and Speed Cameras. The previous app, which had promised "free lifetime updates", is not available for purchase on Play Store anymore and it's maps are not updated since October 2015. TomTom claims their definition of lifetime map updates is "the period of time that TomTom continues to support the app with updates". Previous customers of TomTom's Android navigation app are offered a discount on the subscription in the new app for three years. There is no provision for users who want to keep using the old app under the conditions it was sold with lifetime map updates." The maps are arranged by regions. then, even if you later download other regions, any search you do will be confined to ONE region at a time! Since I already had ~2GB of google 'offline areas', ~500MB CoPilot maps, ~300MB Here map, I had to get rid of most of those to have enough room for 5GB, on the (faster) internal storage of a 16GB tablet. 16GB is now practically the minimum but there's also not too many 32GB Android tablets, but now I'm wishing/hoping they become more common. The StreetPilot app doesn't even have a manual, and the TomTom manual puts the Garmin Nuvi manuals to shame. My internet connection is dog slow, rarely even get 1mbit/set. So I will wait until bedtime and do the download. I have a 128gb iPhone 6s+ with over 50gb free, so space shouldn't be an issue. 50 miles of driving (any use of the app, not just routing)… that would be like a regular day for me, LOL. In my rural area, it's a 30 mile trip to the grocery store. But I don't have a problem with that. Can check it out for free and see if I want to purchase. The Garmin app cost $80 then in-app purchases for traffic and pedestrian navigation took it up to about $100. That would buy 5 years of TomTom, sounds reasonable to me. That appears to be the newest manual too. I stumbled across some older ones before I found the 2016 android app manual. TomTom looks like they are serious about making a full featured app. Yep, and that's really been the drawback all along. The PND makers were the ones who had the experience to do it but didn't want to jeopardize their hardware PND business by creating apps with comparable functionality, and didn't see the writing on the that they were going to lose that anyway. Now google has skimmed off the bulk of the need, at least in areas with good data coverage. BTW, one problem I'm having right now is I can't figure out how to get a multi-stop route from the trip planner site into the TomTom Go mobile app (or Go PND). They show up in the list of routes but one the start and end are there. The manual and the UI itself makes a point of differentiating between tracks and routes, and there's a Wikipedia article that goes into more detail. All I know is, I need to plan a trip - with stops - and have the same route and all those stops transfer easily and reliably to a nav device that will work without a data connection. If I'm only going to get 'tracks" (no stops), I'd have to add the stops separately as saved places, then rebuild the route. That defeats the purpose. That was one great thing about planning a trip in Furkot and then exporting a CoPilot .trp file: it opens into CoPilot with the entire route & all the stops. Too bad CoPilot isn't that great at giving directions from it. An Itinerary is a plan for a journey including more locations than your final destination. Note: This feature is not supported on all devices. is a feature is not supported on all devices, including, or so it would seem, any of their latest PNDs, or their trip planning website, or their mobile app. If that's true, that's pretty wacked ! OK, looks like my suspicion was correct. ...evidently what it has NOT done is allow the online trip planner site to CREATE itineraries! ...and evidently TomTom has no trip planning software that will create itineraries or save .itn files. Some of these have posts implying that the feature just hasn't been implemented yet... should be soothing... until you notice the dates stretch back 2 years. One thing I did learn: apparently all the newest TomTom PNDs can import itinerary files. The above statement in the previous post about "not supported on all devices." must be old. "GPS eXchange formatGPX files are used by many GPS devices and navigation apps. They contain a combinations of waypoints, routes and tracks. The exact content of the exported GPX file depends on the export options. Waypoints representing trip stops and routes based on trip course. One route for each day. The number of routepoints depends on the points per route value. Waypoints representing trip stops, tracks and routes representing trip course. One track and one route for each day. The number of routepoints depends on the points per route value. When Furkot exports waypoints corresponding to stops that have been tagged, the tags are exported as categories defined by the Garmin Extension Schema." So it looks like only Garmin PNDs can import .GPX routes that have STOPS in them. it is NOT possible to export that trip - WITH the stops - to a mobile device running the TomTom mobile nav app. Places do export (and sync between the website and the device) just fine, and quickly, but not intermediary route waypoints. That being the case, I decided to build a multi-stop route in the TomTom mobile nav app (Android). It is possible to do that, but it is a fairly cumbersome process. compared to the other most popular counterparts (google, Bing, Here, mapQuest & CoPilot) needs to be examined first. and there's really no doubt which one is the best one, assuming no adverse weather or roadwork. please feel free to check it out and report the result. For this test, I'm not really concerned about the variations in driving time. Evidently google only includes actual driving time, and its estimates are almost always too short for long trips after accounting for stops. What's noticeable is that all of these got the correct route and their estimated distances are all very similar. mydrive.tomtom.com, Step #1, Default route is not the best route. 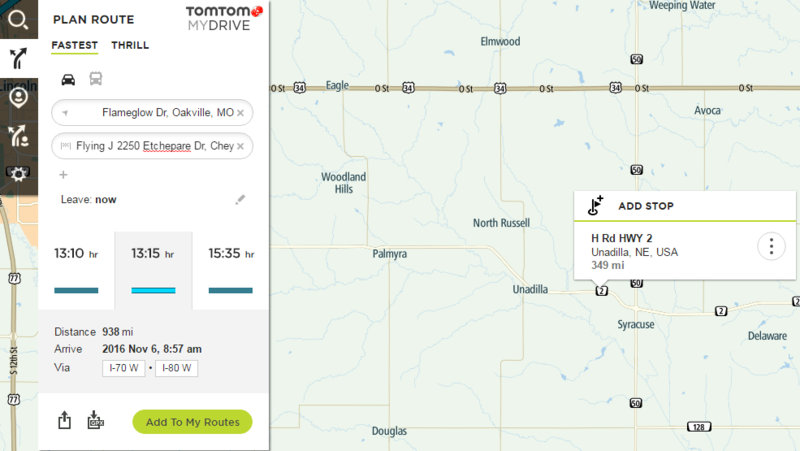 mydrive.tomtom.com, Step #3, Zoom in to add a waypoint to force the route where it needs to go. No option to add a "Via Point" so I have to add a stop and then ignore those directions during the actual trip. 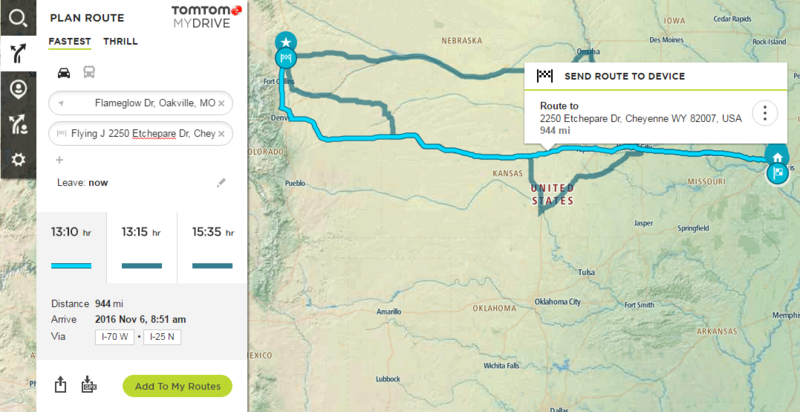 mydrive.tomtom.com, Step #4 = 892 miles, 12:50 The corrected route is now similar to all the others. (due mainly to the relative slowness of the TomTom site). So that means that planning a trip like this on the TomTom trip planner site is pretty much useless if the intention is to use it with the TomTom mobile app. TomTom mobile app, it is a WHOLE LOT MORE TROUBLE than it is on their trip planner site. If you haven't already tried the "Here" mobile app, I'd give that one a shot too. While the Here mobile app will not do multi-step routes, the website WILL do multi-step routes, and the places on a multi-stop route can be saved, and automatically sync'd with, a mobile device signed into the same account. Unlike google's saved places, Here allows saved placed to be organized into user-named "collections." This means that one viable way to plan trips on wego.here.com is to save each waypoint as a numbered step with all steps in any one trip organized in a named collection. Another thing Here will do (unlike google) is allow you to download maps, state-by-state, that don't expire. Given the drawbacks I've found with the TomTom app's lack of route import capability, and the fact that they haven't even claimed that is forthcoming, Here is looking better all the time. Here's one key advantage Here has over CoPilot is the routing instructions are generally better, and Here's "detailed" (last quarter-mile) routing accuracy is better too. But the Here app doesn't have junction view and it won't even announce street names without the Hi-Fi voices, which Here no longer offers. But those voice files still work, and I do have them. Let me know if you want them. A guy walks into a bar and sees a funny shape bowl on the floor. He asks the bar man "What's that on the floor?". The bar man tells him it's a spitoon. Our hero, always up for a bet, says to the bar man - "I bet $100 I can drink some of that". Bar man says "OK - you are on". So he lifts the spitoon to his lips and gulp, gulp, gulp. Barman says "That's gross - OK - you win $100". But the guy just shakes his head and carries on - gulp, gulp, gulp. The barman says "Man, stop you are making me feel sick". But our man just carries on - gulp, gulp, gulp. And finally one last gulp and the man puts down the empty spitoon. The bar man says "It was $100 to drink just some of it - why did you drink the lot?" "Cause it was all in one lump." I tried to install TomTom on my Android phone but I didn't have sufficient storage because the maps for Australia are all in one lump - 540MB. While the Here mobile app will not do multi-step routes, the website WILL do multi-step routes, and the places on a multi-steo route can be saved, and automatically sync'd with, a mobile device signed into the same account. Like you guys I am always on the lookout for the perfect satnav app so I have just installed Here We Go (after uninstalling TomTom to clear storage). It is able to download state maps (279MB for WA) rather than in one, you know - Christine says my joke will get me banned so I won't repeat the word - 879MB file for the whole of Oz. However, Indonesia, where I have just got back from, is only available as a single 540MB download whereas, maps.me allowed me to select just Bali (plus some islands to the east such as Lombok). I would like to get the voices for the Here We Go app. How do you propose to make them available? Possibly upload them to OneDrive or Gdrive and share them. I have just had a closer but very cursory look at the HWG map of Bali. m.m which uses OSM seems to have more POIs, specifically bus stops for local buses, intercity bus stations and hotels. We caught the bus from Sanur to Nusa Dua (28km) for 3500 rupiah (IDR). It sounds a lot until I tell you there are 10,000 rupes to 1AUD (= 0.75USD) which means that 100AUD = 1,000,000 IDR. Everyone's a millionaire in Indonesia. The bus is an express service and the stops are up to 2km apart so it's very important to know where the stops are so you don't wander off into the 31C, 97% humidity in the vain hope that there will be a stop just around the next bend. HWG doesn't show the full street, laneway, pathway layout in Sanur, Pantai (Beach) Lovina, Ubud (where we walked for > 10km out into the rice terraces on paths shown on m.m but not on HWG) or Kuta. HWG doesn't show any of our hotels in these towns, which is very important when you are walking with a backpack from the bus station, that are shown in m.m. If you're going to go to Bali I would definitely recommend maps.me over Here We Go.